I've been hearing the name but it was only today that I got to taste the cake. 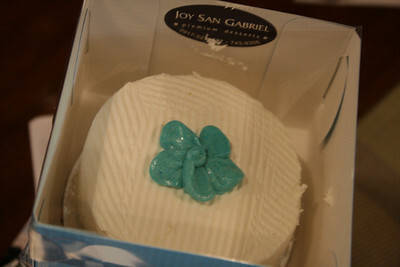 And I guess it's safe to say that Joy San Gabriel cakes are one of those that you really recommend to friends after trying it. I got to taste a mini blueberry cheesecake and a mini choco walnut cake, giveaways from a wedding I attended yesterday. Both weren't too sweet to be enjoyed at all, and both cakes were baked fluffy and light. The cheesecake melts in your mouth and I loved the sweet ganache and walnut layer on the choco walnut cake. Am not sure but Joy San Gabriel seems to be known for her wedding cake trees, which offer a lot of versatility to wedding hosts since they won't be tied down to just one cake flavor, and they can give away these mini cakes as reception dessert or wedding giveaway. Do contact Ms. Joy to enJoy her cakes! i think she had a stall in market2 before and i got to try her mini choco cake.